The Piccirilli Brothers—Attilio, Furio, Thomas (Masaniello) and Horatio (Orazio)—of New York City created cast-stone ornament on the tower and façade of the California Building and on the two gates framing the Quadrangle. The sculptures and ornamentation were executed in cast stone by the Tracy Art and Brick Stone Company of Chula Vista from molds prepared from plaster models executed by the Piccirilli brothers. Like their father Giuseppe, the sons were well-known marble carvers and sculptors, most notably having carved Daniel Chester French’s seated statue of Abraham Lincoln for the Lincoln Memorial in Washington, D.C. Figures on the façade constitute a hall of fame. They are Fathers Junípero Serra, Luís Jayme and Antonio de la Ascención; explorers Juan Rodríguez Cabrillo and Sebastian Vizcaíno; and busts of Governor Gaspar de Portolà, explorer George Vancouver and Kings Charles V and Philip III of Spain. By setting idealized depictions of past notables in three-quarters life size, dressed in swirling clothes, against a background of wriggling ornament and broken entablatures, Goodhue and the Piccirillis created a Spanish Revival façade rich in texture and effect. The tower, with its slender, graceful profile and modulated levels, is more impressive than the façade, so much so that today the building is commonly called the California Tower. Both façade and tower have been copied often by American architects. Photo from the website of the National Building Museum, which cites The American Magazine, 1930. 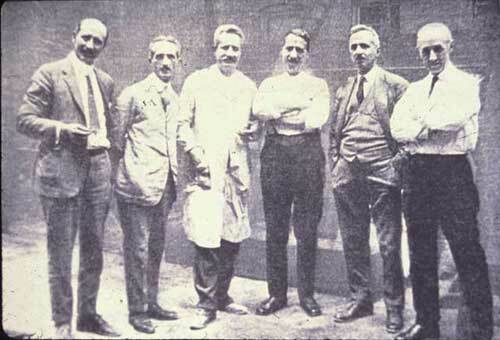 From left to right Getulio, Furio, Attilio, Ferruccio, Masaniello and Orazio.